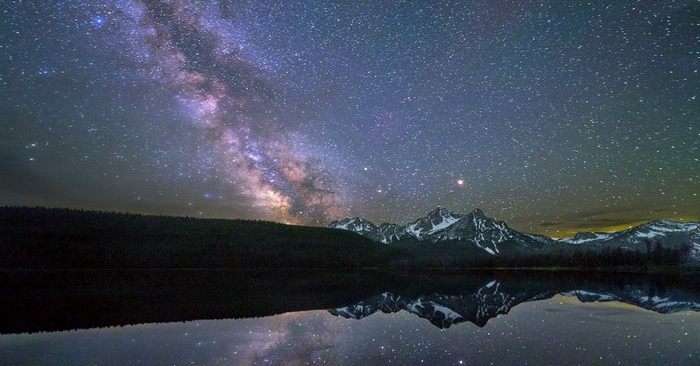 Light from the Milky Way is reflected in the still waters of Stanley Lake in the Central Idaho Dark Sky Reserve. Photo by Wally Pacholka / AstroPics.com. An area spanning more than 3,600 square kilometers (1,400 square miles) in central Idaho, U.S., has been designated as the nation’s first International Dark Sky Reserve. IDA today announced the accreditation of the Central Idaho Dark Sky Reserve, the first of its kind in the United States and one of just 12 such reserves worldwide. Supporters of the reserve say the vast area now between Stanley and Ketchum will ideally help combat the use of artificial light that adversely affects the environment and can have negative and deadly effects on a variety of creatures, including amphibians, birds, mammals, insects and plants. IDA’s Reserve designation requires public and private lands to possess an exceptional or distinguished quality of night sky, view of the stars and nocturnal environment. Reserves can only be formed through partnerships of multiple land managers who have recognized the value of quality nighttime environment through regulation and long-term planning.